Keeping chickens as pets is not a new idea and some breeds seem to prefer being a pet than just one of the flock in the yard. Some bantam breeds, especially if handled a lot as chicks can make great pets, even great house pets. Chinese Silkies seem to make the best pet chickens. Their soft fluffy feathering and unusual look makes them desirable and when tame, very cuddly. Chickens are smart and quickly learn who their friends are and where the good food and treats come from. House chickens have been fitted with diapers to prevent their frequent droppings from messing up the house, but have to be changed often to prevent build up and problems for the chicken. Just about any chicken will be happy as a pet. Being a flock animal, they are most happy when they have company and attention, even if it’s human. If you plan on keeping chickens as pets you should still provide the basics that chickens need for a healthy and happy life. Chickens need good food, fresh greens, some fruits, seeds and a constant source of clean water. They need exercise and sunshine and benefit from spending time outdoors scratching through grass and soil for natural things to eat. Chickens want a safe place to sleep at night, which can be accomplished in many ways. A pet chicken can be brought in the house and placed in a cage, or have a safe place in the garage or another out building where predators can’t get to them. Pet chickens certainly don’t have to be house pets. Keeping chickens as pets can just mean all your chickens have names and that you would never consider raising chickens for meat. You might take extra care of them and they might visit the vet if you are concerned about a health problem. Some people put a harness and leash on a pet chicken and take them for a walk. There is no limit to the creativity some people show when having pet chickens. The more chickens someone has, the less likely they are to keep them as pets. It’s generally people that have just one or two that seem to be drawn in by their personalities and want to make a pet out of a chicken or two. I’ve never been one for keeping chickens as pets, but that’s not to say it would never happen. I’ve never seen one in person, but the tiny Surama chickens are on my wish list. I think they are perfect pet sized chickens. A friend of mine had a pet Silkie rooster that slept in her living room on a parrot stand each night. She let him out each morning to free range with her other chickens and farm animals and every evening he showed up on her front porch railing waiting to be let in. There really aren’t that many pet birds you can do that with, so in a lot of ways, chickens can make great pets. Chickens are curious creatures and are probably just as interested in us, when they become a pet, as we are in them. Keeping chickens as pets is not a bad idea at all, especially for children. Raising chicks is a great way to start since children usually have a lot more interest and time to spend with pets. If they grow to be large or just a little bantam, chickens can make great pets and become very tame with much handling and gentle experiences with people. The larger the chicken or with multiple chickens, the bigger the mess they make, so chickens as house pets isn’t for everyone. I really believe adult chickens are happier and healthier with a good outdoor coop and yard. 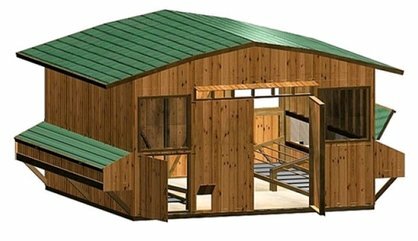 If you're ready to provide your chickens with a proper coop then you're probably wondering about the planning aspect. In fact, one of the questions I get most often revolves around coop plans. In order to best help you in this area I took the time to preview a couple coop plan resources. Take a good look as I narrow it all down to help simplify the process for you.